Each year at St John’s, students who excel academically and contribute to the life of the College, can be nominated for the prestigious Larmor Awards, which are presented on the morning of General Admission, or “Degree Day”. The Awards, presented by the Master, are named after the twentieth-century physicist and mathematician Sir Joseph Larmor, FRS, a former student at St John’s who made great innovations in the understanding of electricity and thermodynamics. Nominees for the awards are recommended by a Committee of both College Fellows and undergraduate students, based on “intellectual qualifications, moral conduct and practical activities”. Each year the Committee face a difficult task of selecting winners from an invariably brilliant field of students. 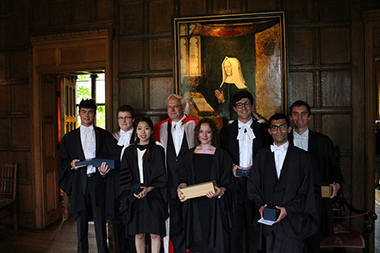 Winners of a Larmor Award receive a unique handcrafted piece of silverware engraved with the College crest and their name, as well as a financial prize.